I grew up with six sisters, a mother who read us Dr. Seuss books and occasionally wrote rhyming poetry, and a father who built a huge blackboard on a kitchen wall where we big sisters taught our little sisters their letters and numbers. My earliest known writing was on that yellowish double-lined paper we used in grade school back then. I wrote about walking my neighbor’s black cocker spaniel Zsa Zsa. As I remember, the story was enthusiastic and joyful. The dog, however, was mean. I was writing fiction. I wanted to bring that paper along on my school visits, but alas, I couldn’t find it. In high school, I spent much of my time in the biology room. My friends and I took care of the plants and snakes and frogs at lunch time and after school. We went off to the Trees for Tomorrow conservation camp, marveled at the really truly dark, and brought back tiny trees to plant at home. One of the two I planted at our old house is still standing tall. My sisters and I swooned over the Diary of Anais Nin. I wrote poetry back then, but alas, I didn’t save any. My sister Judy and another friend and I memorized a collection of poems by Joseph Pintauro called A Box of Sun. I couldn’t find any online to share, but I still remember. In a college creative writing class, I wrote a poem about my sister Judy’s cats. 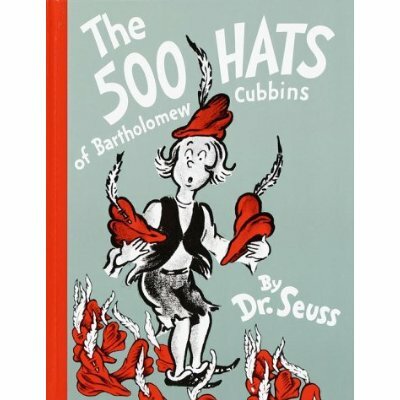 Twenty years later, I was reading a rhyming picture book to our sons. I thought it might be fun to write a children’s book, and I remembered that poem, which I had saved in a file cabinet. When I dug it out, I was amazed to find a note from my instructor saying that it might make a good children’s book. Judy sleeps with cats on her bed. One in her arms and one on her head. Because they keep her warm, you see. With one on her stomach, one on her chest. She cannot make them go away. When she rolls over, so do they. One on her back and one on her feet. And so they dream the whole night through. When Judy wakes up, the cats do, too. With one at her heels and one at her toes. I sent it out to a number of editors, got some helpful feedback (in those days, they had time to respond), revised it, and sent it out again. 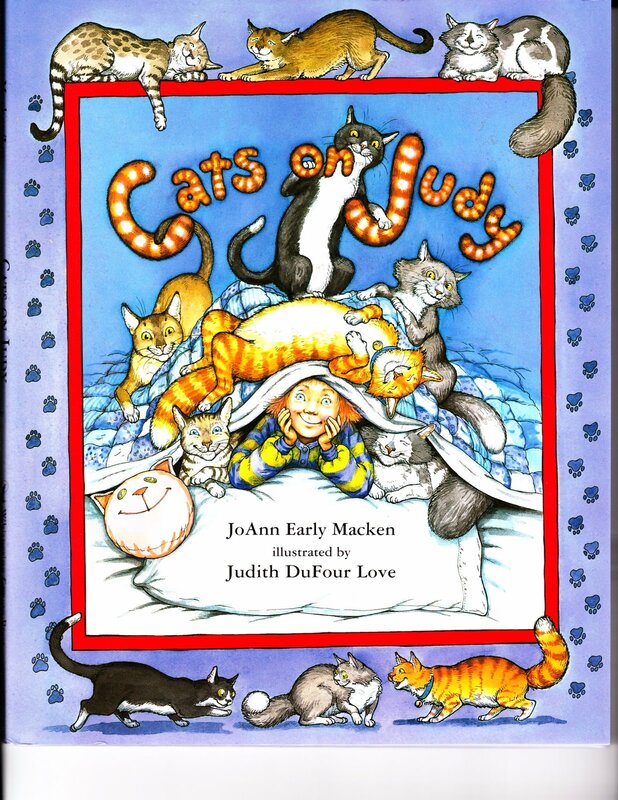 After a year or so, that poem, expanded to fit a 32-page format, was accepted to become my first published book, Cats on Judy. That’s when I decided to get serious about writing for children. So many writing memories. I enjoyed the story behind your first published books. I only had one cat instead of Judy's two, but she slept with me just like that. Thanks for sharing your trip down memory lane and your writing journey. Did you ever let your instructor know that you'd written and published the book? Kay, the funny thing about the book was that although I wrote the poem about two cats, the illustrator kept adding cats to the illustrations until she had six at the end! Molly, I tried to locate that instructor, but I wasn't able to find him. I wish I could have told him! My cat wakes me up when I sleep beyond 6 by sharpening her claws on the side of the bed. That sound! Wakes me up every time. Love your cat poem that became a cat book and the story of your background in writing. Children's literature became a passion for me in college in my children's lit class for elementary ed degree. When we look back at our path, we can see more clearly where it was leading all along. Thank you for sharing how CATS ON JUDY came to be, JoAnn! I love hearing about your sisters, that blackboard and how that first picture book came to be, JoAnn. Your sister Judy must love it! All that happened 'when we were young" keeps popping up to guide us. Thanks for sharing! Thank you for sharing this! I loved reading it! And I'm not surprised that the illustrator kept adding cats! That's what I was picturing, too. Isn't it funny how we get pictures in our heads of a story/poem that are different from another person's view. That's the best. Zsa Zsa sounds like a grand character for a book! Thank you for the lovely poem, too. I really enjoyed reading about your journey. Nice! Very inspiring story. Love the poem and the light rhyming voice. Oh, I love this story! It's fascinating to hear how writers got their start, and the journeys that stories take from idea to publication. I didn't know the story behind Cats on Judy. Thanks so much for sharing it! 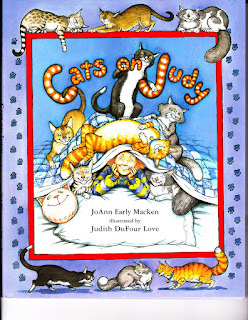 I love the poem that inspired "Cat's on Judy," So lively and moving, It's on my list to read now. Thanks for sharing the history of how it came about JoAnn, and tidbits about other poems from your school days.